2. Scroll down to the bottom of the Moodle home page and click on the Creation / Enrollment link in the Course Preferences block. 3. 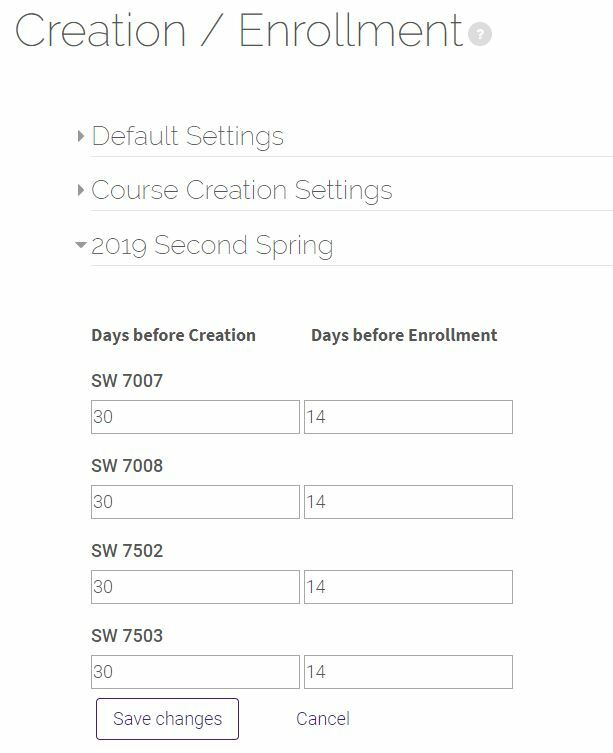 In the text fields for Days before Creation and Days before Enrollment, enter numbers for how many days prior to the first day of class you want these processes to take place for your upcoming course(s). For example, if you would like your course(s) to be created 50 days prior to the first day of classes, enter the number 50 in the field under 'Days before Creation.' The maximum limit is 60. The creation value must be larger than the enrollment value. 4. Click the Save changes button near the bottom of the page. Note: If the date is within the window of days prior to the first day of class, your course will be created immediately, but student enrollment from the Mainframe is an overnight process. 2. 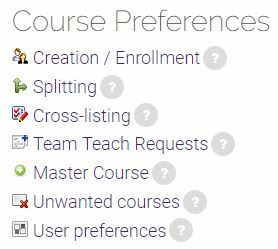 Click the Creation & Enrollment link in the Course Preferences block at the bottom of the Moodle home page. 4. Click the Save Changes button after all updates are made.